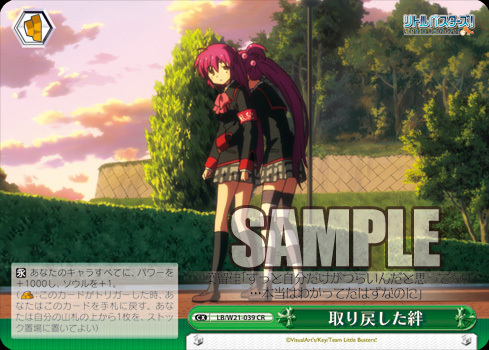 Weiβ Schwarz Cards of the Day: 9th+10th of May | TCG, shiyo? The week was rounded out with even more Psycho-Pass and Little Busters! with the Level 3 Makishima finally revealed. [AUTO] When another of your «公安 Public Safety» characters attacks, during that turn, this card gains Power +1000. Our final Kogami card for the week is a fairly standard effect, except of course themed to the set. If left late enough when attacking it means he can reach 10,000 Power, which is a threat to many Level 2 cards and can match the base of many Level 3s. However if you play multiple copies at once they won’t all be able to benefit from the full boost. They’ll also be a little bit lacking when on the defence. Finally, since he relies on «公安 Public Safety», you won’t be able to make full use of him if you opted to play a Red/Blue deck. 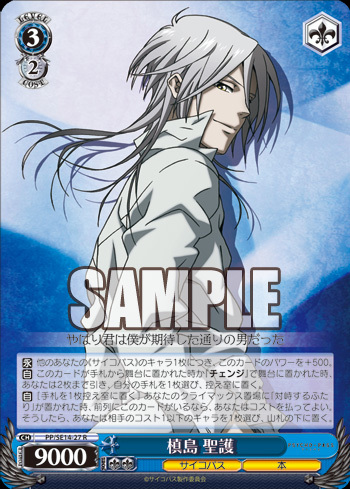 [AUTO] [(1) Place the top 1 card of your Deck in your Clock] When [Promise from that Time] is placed in your Climax Zone and this card is at the Centre Stage, you may pay the Cost. If you do so, choose 1 of your opponent’s Level 1 or below characters and send it to the Waiting Room, during that turn, this card gains Power +1000. Kanata sports both a Climax combo and Encore, which should make up for her relatively weak Power. The Climax combo is quite costly, since it requires you to take 1 damage in the process, however it is also a powerful effect that can potentially mess up some of your opponent’s plans. Usually I expect you’ll want to get rid of your opponent’s Back Stage cards, such as the annoying Encore giving ones from Disgaea or Angel Beats!. This is because those cards tend to be the hardest to get rid of. The Power boost this card gains will probably be less important, but will at least push her to the 1/0 vanilla standard. With Encore you should hopefully be able to keep Kanata alive long enough to make use of the Climax combo. This is the Climax that goes with the above Kanata. 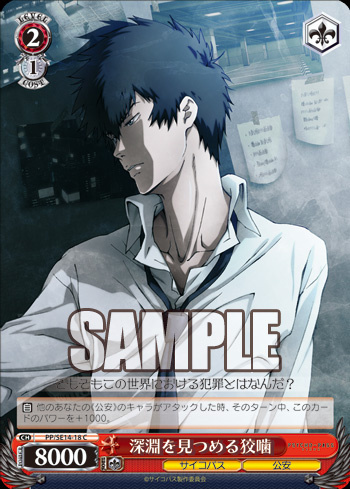 [CONT] For every 1 of your other «サイコパス Psycho-Pass» characters, this card gains Power +500. [AUTO] When this card is placed on the Stage from your Hand, or via [Change], draw 2 cards, then place 1 card from your Hand in the Waiting Room. [AUTO] [Place 1 card from your Hand in the Waiting Room] When [Confrontational Pair] is placed in your Climax Zone and this card is at the Centre Stage, you may pay the Cost. If you do so, choose 1 of your opponent’s Cost 1 or below characters and send it to the bottom of the Deck. The end point of the Change combo is this Level 3 Makishima, who has a pretty strong Climax combo. For starters, his Power could grow as high as 11,000. 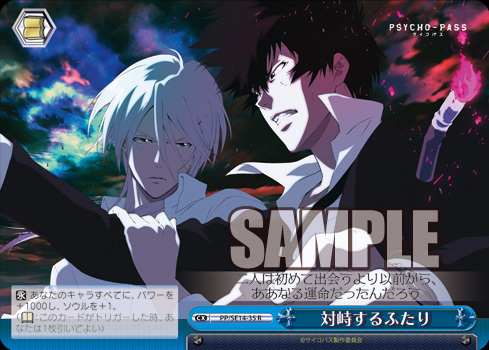 However you need to consider the fact that the Akane cards do not feature «サイコパス Psycho-Pass», meaning you might need to think more about the support cards you play alongside this card. If you do manage to play him during Level 1, your opponent will probably find it hard to get rid of him for a while, since it would usually take another Level 3 to defeat him. His second effect is one of the Level 3 standards, allowing you to replenish your hand immediately, and at least partly help with paying for the 3rd effect. The final effect is similar to Kanata’s above, except that he goes after Cost 1 or below cards, rather than Level 1 or below cards. This means he can take down nearly any support card in the game, which could seriously put a dent in your opponent’s capabilities late in the game. Since it goes to the bottom of their Deck it also means they cannot Encore it, and you’ll know what the bottom card of their Deck is. [CONT] All of your characters gains Power +1000, Soul +1. This is a standard Book Trigger and works with the above Makishima. 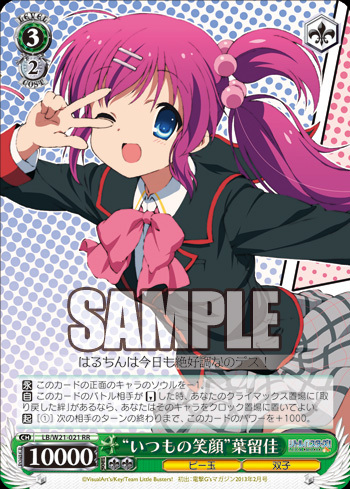 [CONT] The character opposite this card gains Soul -1. [AUTO] When this card’s battle opponent is Reversed, if [Regained Bond] is in your Climax Zone, you may place that character in the Clock. [ACT] [(1)] Until the end of your opponent’s next turn, this card gains Power +1000. Our final Little Busters! 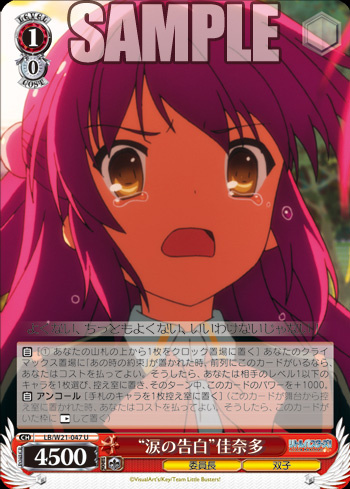 card for the week is a Level 3 Haruka who could help cause game ending damage. Her first effect could protect you from some damage late in the game, and makes it hard for your opponent to just ram low Level cards into her to try and win. However once you reach the very end of the game, you might sometimes want the extra damage in order for you to increase the chance of the damage being cancelled. Her second effect is a Climax combo that sends her defeated opponents to the Clock, causing unblockable damage, which could be very useful for ending the game. Often these effects come attached to characters that don’t have particularly high Power, since it makes it harder to pull off such a powerful effect. However for Haruka, her 3rd effect allows you to boost her Power as high as you need, provided you have the Stock. If you can guarantee the win it’ll be well worth all the Stock. Even if you don’t end up using that effect to aid in causing damage to the opponent, you’ll at least be able use her as a powerful attacker or defender. This is the Climax that goes with the above Haruka. Since it’s a Gold Bar Trigger, it means you’ll be able to use it for the combo even when you do happen to Trigger it instead of drawing it.